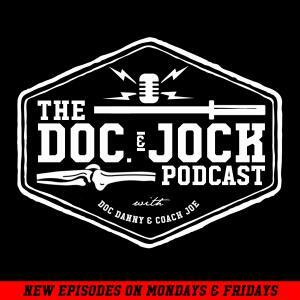 Gang if you are interested in a FREE copy of Ben Greenfield’s Look Good Naked Longevity Plan simply head over to iTunes, review the Doc and Jock Podcast and post a screen shot of that interview to the Doc and Jock facebook page linked here! This is a 49 page resource from one of America’s most influential trainers. Most folks have to pay for this resource, not the Doc and Jock audience! Looking good naked is a review away folks! In this new segment Coach Joe answers a question about coaching athletes to squat. In many coaching circles coaches teach their athletes to drive through their heels. In Joe’s mind this is a que gone terribly wrong. The facts are that most new athletes do not have the tools to squat properly. The culprits are usually poor ankle flexion, a weak and/or underdeveloped posterior chain, and in general, poor body awareness. A quick fix in the beginning, in some cases, is to ask the athlete to drive through their heels. Joe discusses how driving through the heels should be thought of as a corrective cue, not one to promote the most optimal movement pattern possible. Joe is not alone in this line of thinking. Joe discusses a conversation he had with Donnie Thompson, linked here. In the talk Donnie talks about why the cue works for many people, and also why it is not the most optimal cue to promote athleticism. Also, within the youtube clip Donnie discusses other nuggets regarding foot maintenance. Brian Mackenzie makes a similar point in a recent instagram post, linked here. In the post Brian writes, “Being in your heels isn’t how you were designed to move, ever. Being in your heels was a que that took off, and I used it a lot as well, to get people who had no posterior chain development…” Check out the full post here. Joe has written and discussed this topic at Joe’s Barbell and on his YouTube channel. Here, Joe discusses tempo in squatting and how to properly squat with the legs and, here, Joe writes about applying tempo. Check out the links below to learn more about Joe’s perspective on squatting, Weightlifting and life by checking out www.joesbarbell.com and the links below. Also gang, be sure to check out the Podcasts mentioned in this show.